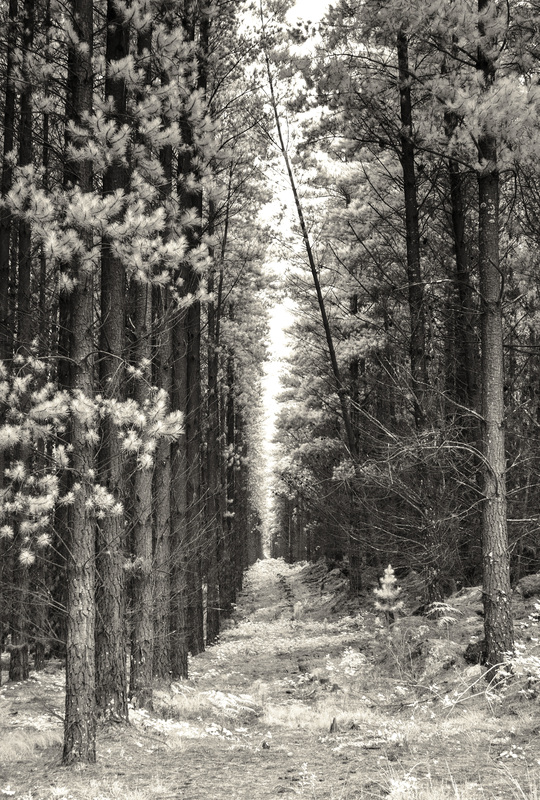 This is an image that I am chasing – it isn’t there yet, but it is a start, a line of thought one might say 🙂 It is taken in a huge pine plantation which I need to explore more…the original inspiration came from an image by world renowned photographer Jim Brandenburg. Robyn from Captivate Me included me in the B&W Challenge where you post 5 consecutive B&W images and nominate a person to take up the challenge with each post, so this is my Day 4 of 5. In turn, today I am nominating Ben from Aperture64. I must stress, this is NOT a have to participate challenge but something that might be fun, but only if you have the time and/or inclination and feel comfortable with it. Taken in near IR on a modified Nikon D90. Monochrome Madness 48 & Day 3 of 5! Thank you and for taking time to comment! Good image to work with – I know what you mean about “chasing” and image – some are just like than – elusive, but so worth the journey. This one is a little spooky, I’m mindful that it would be very easy to get lost! I thought of you when I posted it! that is so sweet to say!! Thank You for the Nomination I will try and post something worthy of it for the next 5 days. Your image isn’t there yet? Well, it’s damn close. Love it.